Jackson Merrett was among the best performers for the Bombers on Sunday, picking up 25 disposals. Photo courtesy of David Nelson. Essendon’s winning ways in the VFL have come to an end with the Casey Scorpions proving too strong with a 17 point win at Windy Hill on Sunday. In strong winds, the visitors opened up an early lead and were never threatened after a dominant third term, winning 10.11 (71) to the Bombers 7.12 (54). In the second versus third clash, the conditions didn’t lend themselves to free flowing and entertaining football but the Scorpions came ready for the fight. Casey won the toss and kicked with the advantage of a howling wind in the opening term. The Scorpions dominated possession but the Bombers defence, led by Nathan Grima and Jason Ashby, was more than up for the challenge. The heat was on around the contest with stoppages and the umpires whistle a common occurrence. At quarter time the Scorpions led the inside 50 count 22 to Essendon’s four, but goals from Shaun McKernan and Jackson Merrett restricted the visitors lead to 20 points. Kicking with the aid of the wind, the clock was approaching time-on when Ben McNiece finally broke through for the Bombers first of the second quarter. The home side missed several opportunities in front of goal before Jack Langford converted shortly before the siren to bring the Bombers to within a goal at the long interval. An errant elbow forced Sam Michael to the medical room for five stitches above the eye, passing a concussion to test to retake the field in the third term. Casey, who was eliminated by Essendon in last season’s elimination final, stepped up a gear throughout the third quarter kicking five goals to one to lead by 30 points at three quarter time. The last quarter played out much like the second, with the Scorpions getting numbers back to suffocate and not allow the Bombers any clean possession forward of centre. Nick Kommer gave the Bombers a glimmer of hope with a snap goal from the boundary heading into time on, but that was quickly doused by the visitors who replied immediately with the aid of a 50 metre penalty to regain a 25 point advantage. Nathan Grima was a clear standout with 18 possessions, repelling countless Casey forward entries with intercept marks, spoils and initiating many of the Bombers forward forays. Essendon captain Daniel Coghlan led by example and on the possession count for the Bombers with 25 touches along with Jackson Merrett. Patrick Ambrose had 23 disposals, Tom Wallis gathered 19 while Ben McNiece and Jason Ashby joined Grima with 18 possessions. Playing against his old side Mark Jamar, who was without the support of Gach Nyuon who was rested, had his highest tally of the season with 18 touches. Essendon assistant coach Mark Corrigan said the side will learn from the way their opposition approached the game. “You have to adapt and be willing to change your game depending on what the conditions are - it’s a great learning curve for us, they are a great side and we were not quite up to it,” he said. The Bombers tried to maintain intent to score going against the wind, so the focus was not complete defence according to Corrigan. “In the last quarter the message was to take the game on, to be aggressive and brave with our ball movement and try and kick some goals. We knew we were going to have enough forward entries, it was just if we could capitalize,” Corrigan said. “You can’t blame the conditions; both sides had to play in it. Click back to essendonfc.com.au on Tuesday for more VFL news and the coaches’ wrap from Sunday’s game. 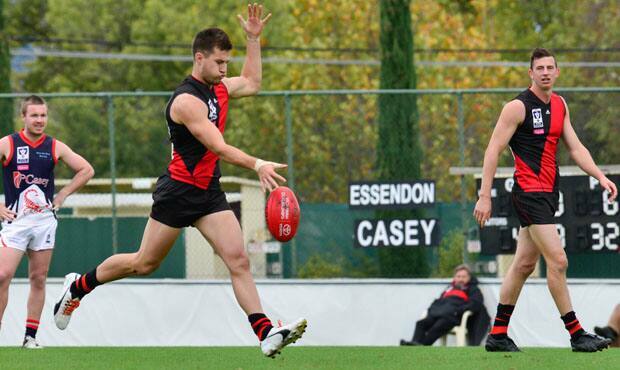 Essendon 7.12 (54) lost to Casey Scorpions 10.11 (71). Goal kickers: Jack Langford 2, Ben McNiece, Shaun McKernan, Jackson Merrett, Nick Kommer, Jacob Thompson 1.